On June 6, 1944, allied soldiers from America, Great Britain and Canada landed on 5 beaches of Normandy for D-Day (also known as operation Overlord) to help the French from the Nazis. This operation was the turning point of the conflict as it marked the beginning of the end of WWII. In 2014, Normandy celebrated the 70th anniversary of the D-Day. This is the first beach where the operation began. There is a museum, the Utah Beach Museum, which pays tribute to the soldiers and describe the D-Day through a rich collection of photos, objects, vehicles, and stories from the preparation of the landing to its success. 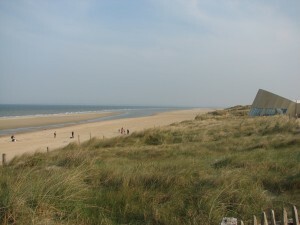 You can also visit Saint-Mère Eglise which is a village near Utah Beach. It was the first village to be liberated by the American paratroopers. Every year, Sainte-Mère Eglise pays tribute to its liberators among whom John Steele, the famous paratrooper who remained hanging on the bell tower of the church. This is where the most brutal fighting took place, hence the nickname ‘Bloody Omaha’. The casualties were reported high: approximately 30% of the total loss of the D-Day. Around the beach itself, there are 3 things that you must visit: the Beach Memorial Museum , the cemetery and ‘la Pointe du Hoc’. 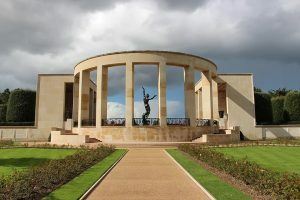 The Omaha Beach Memorial Museum was founded in memory of the soldiers. You will find the materials and the objects they used during their operation on the beach and some recreated scenes sometimes with testimonies. 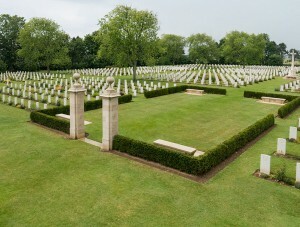 The Normandy American Cemetery and Memorial is the first American cemetery in France. It gathers 9387 white gravestones which are perfectly lined up. Every day, at 4:15 pm (from 16/09 to 14/04) or 5:15 pm (from 15/09 to 15/04), the visitor has the opportunity to attend the ceremony of colors, where the American flag is taken down and folded while a band plays the American anthem. Located between Utah Beach and Omaha Beach, the Pointe du Hoc is one of the most evocative of the D-Day sites. Because of the steep cliffs, the landing was made particularly difficult but US Army Rangers scaled it all the same to disable a German gun battery. It is now bomb-cratered and you can see the remains of old bunkers. Gold Beach is most famous for being the landing site of the British Army. But the most interesting sight of the area is the artificial harbor in Arromanches, where the Allies sank dozen of floating blocks to construct an artificial harbor, which allow them to disembark the military materials in the following months (more than 500 000 vehicles, 7 000 000 tonnes of materials and 2 500 000 men). This is well explained in the museum dedicated to it. This is where 14 000 young Canadians disembarked, all of them volunteers. Half of them perished on the beach. Nowadays you are still welcome by young Canadians when you visit the touching Canadian cemetery and the Juno Beach Center, dedicated to the engagement of the Canadians in the war. Sword Beach was the site of the landing of the British division whose aim was to go free the city of Caen, 10 000 miles south of the beach. There were not a lot of casualties during the landing itself, but the British met the Panzer Divisions which counterattacked just south of Sword Beach and the battle was fierce. It was this beach, more exactly Ouistreham, which was chosen to commemorate the 70th anniversary of the Landing, in 2014. Utah and Omaha were called like that after the name of the place from where the commanders of the landing divisions were originated. Gold, Sword and Juno are fishes name (Goldfish, Swordfish and Jellyfish). To avoid the confusion between the fish and the marmelade, Jelly was changed into Juno after the name of one the officers’ wife. 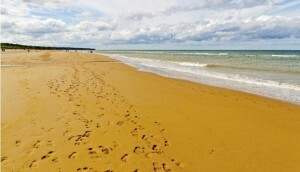 How to visit these 5 beaches of Normandy? 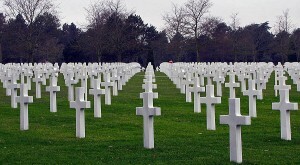 When visiting the 5 beaches of Normandy, you cannot prevent from feeling very emotional. 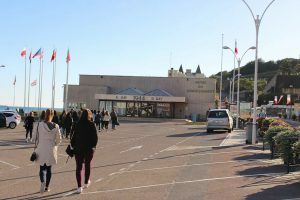 We highly recommend this place for those who love history or for those who want to discover more about the Normandy landings, or for the families who want to pass on the flame of memories to the youngest generations. Of course it will be hard for you to visit all of these places in one day and you should consider staying at least 2 days if you want to see everything. If you only have one day though, you will want to focus either on the American sector or on the British & the Canadian sectors. If you do not go by yourself with your own car we advise you to take a private excursion from the city of Caen or Bayeux, or a day tour from Paris. You can also combine this trip with a one day tour to Mont Saint Michel. 3 more articles you may be interested in.